Today I wanted to share another hot color trend with you for autumn. We are well and truly into the autumn season and it’s about time that we took influence from a new color trends and brighten up our homes and our wardrobes with blush pink. This interior decor photo shows just how warm blush pink can look in the home and lends a lovely autumnal glow to a rustic room. It’s often the fear that including pink in a room makes it look like a child’s bedroom, but this room certainly doesn’t – it looks like a classy grown-up dining room with a decadent twist. This wallpaper would look equally good during the spring or summer and it goes to show that you need not go overboard with the shade in order to get an on-trend look for your interior decor. Another way to bring extra warmth into your life is to combine hues of pink and blush with tweeds, leather and chunky knitwear for your winter look. Take inspiration from these cashmere goodies from the Pure Collection above (all in the sale section at the moment!) and add a blush top or pink denim with your festive knits to bring your winter wardrobe bang up to date. If you can’t stand the sugary-ness of a head-to-toe blush pink look, how about just adding a couple of pastel pink accessories to your outfit, as Pippa Middleton did for Prince George’s christening. She was styled by British couture designer Suzannah Crabb, who chose the combination of blush pinks to coordinate with her “warm blush oyster” coat perfectly. What do you think of this new season color trend? 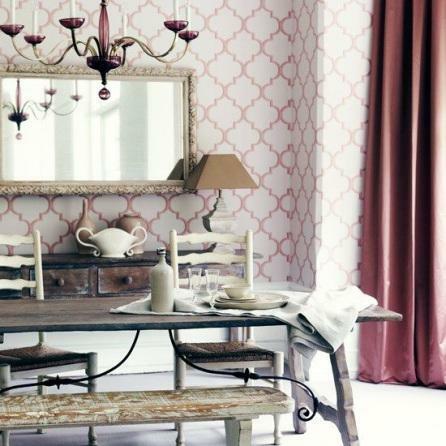 Will you be adding pink to your home or winter wardrobe? Digging out those blush summer clothes that you’d packed away for winter could be a thrifty way to get the look for less – simply combine them with your cream cashmere cardi and your tweed winter coat and you are all set to look super-fashionable for the whole of the winter period.